Prince George Airport (IATA: YXS, ICAO: CYXS) is an airport that serves Prince George, British Columbia, Canada, and the surrounding area. It is located just within the southern boundary of the city, 2.8 nautical miles (5.2 km; 3.2 mi) southeast, and is run by the Prince George Airport Authority. In 2016, 462,007 passengers used Prince George Airport. The airport offers 22 flights every business day between Prince George and Vancouver serviced by Air Canada via its Air Canada Express affiliate, WestJet and its affiliate WestJet Encore, and Central Mountain Air (CMA). CMA and Northern Thunderbird Air also have scheduled and charter services to many points in northern and central British Columbia as well as Edmonton, Alberta. WestJet flies a weekly non-stop flight to Puerto Vallarta, Mexico from November through to April. In January 2015, Pacific Coastal Airlines set up shop at Prince George offering daily non-stop flights to Victoria, BC. Air Canada Express and WestJet Encore both operate Bombardier Q400 turboprop into the airport while WestJet operates Boeing 737 jet liners. In February 2015, Prince George hosted the 2015 Canada Winter Games. Approximately 15,000 people came to the city by air for the games. The airport is classified as an airport of entry by Nav Canada and is staffed by the Canada Border Services Agency (CBSA). The airport can handle aircraft with up to 30 passengers or 120 if they are unloaded in stages. The airport opened in 1920, and until 1932, the site was the bypass highway that ran from Tenth Avenue to Eighteenth Avenue. The airport served as a stopover for aircraft including United States Army Junkers JL-4's[clarification needed] and de Havilland Fours[clarification needed] going to Alaska. In 1932, the airport was moved to the intersections of Highway 97 and Highway 16, near Carney Hill (the same site is now the Prince George Golf and Curling Club). At this second, newer airport, US planes also flew in large numbers to Alaska prior to the United States declaring war on Japan. Planes seen included Douglas B-18's and Martin B-10's. This airport was used until about 1942 and was closed for good on March 31, 1944. During the 1930s and early 1940s, it contained Pineview Elementary School, which was renamed the Airport School. On November 14, 1940, the Canadian-American Permanent Joint Board of Defence set out a need for a number of new northwest airports, including Prince George, for the support of a new Northwest Staging Route. This new staging route would provide protection, permit aircraft to be deployed rapidly to northwestern Canada and Alaska in time of emergency and allow men and supplies to be moved into the region by air. 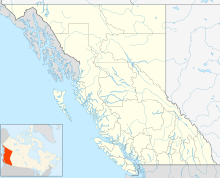 In late 1940, Canada's Department of National Defence contracted to build a new (third) Prince George airport on a bench at the top of the hill about 3 mi (4.8 km) south-east of the city on the old Cariboo Highway, across from the Federal Government's Experimental Farm. This location is now the site of today's airport. The Department of Transport built single family homes, an unmarried staff residence, a diesel electric power plant and vehicle maintenance garage. A small administration building and radio range station was built by Pan American World Airways (Pan Am) and a few years later (1944) this was replaced by a new, larger DOT administration/radio range terminal and a large hangar was built (it burned down in 2009) about the same time. The resident DOT staff were housed on the airport and the Pan Am staff were accommodated in houses built on the east side of the old Cariboo highway, across from the airport. In 1942, the United States Army Air Forces (USAAF) started construction of a number of buildings for their people and for Royal Canadian Air Force (RCAF) staff. The buildings included troop dormitories, a medical clinic, a gymnasium and a cafeteria. The latter was also used for USO shows and movies for airport staff. The US staff component included an Army Airways Communication Station, an Eleventh Air Force detachment (1452nd AAF Base Unit - detached from Edmonton Municipal) and a small detachment of United States Navy staff. The US Navy had a contract with Pan Am to fly men, equipment and everything else from Seattle to Juneau and Fairbanks via Prince George and on to Kodiak (Naval Air Station Kodiak), Dutch Harbor (Dutch Harbor Naval Operating Base), Adak (Naval Air Facility Adak)and back in periods when coastal weather conditions were poor. The Eleventh Air Force's 1452nd Base Unit at Prince George airport were Air Transport Command, charged with facilitating aircraft and supply shipments from the contiguous United States to Alaska on the Northwest Staging Route. The new airport comprised 2,034 acres (823 ha), was completed on August 9, 1945 and had three runways arranged in a triangle. In 1941, after the completion of runway 14/32 (now 15/33), US-based Pan Am operated from the Prince George Airport as a stopover location on its Seattle to Fairbanks route ferrying men and equipment for the US Navy. In 1942, Canadian Pacific Air Lines (CP Air) began offering scheduled flights six times a week into Prince George. Canadian Pacific and its successor Canadian Airlines International served the airport for many years. During 1942, 1943, and 1944, the airport was used as an alternate airport (to Edmonton Municipal) by the United States Army Air Forces (USAAF) for United States to the Soviet Union Lend-Lease aircraft flown primarily from Great Falls, Montana to Alaska and on to the Soviet Union. Planes seen in the new Prince George airport were mostly P-39 Airacobras, P-63 Kingcobras, B-25 Mitchell bombers, and C-47 Skytrain transports. Also seen were RCAF Hawker Hurricanes and Bristol Fairchild Bolingbroke bombers. During the war years, the RCAF ran the airport with close assistance from the Department of Transport and the USAAF. In 1946, with the war over, the airport was turned over to the Department of Transport by the RCAF and the USAAF and RCAF buildings were torn down, leaving the DOT buildings and homes as well as the Pan Am housing. These lasted until the early 1950s when they were either moved or torn down. The hangar was used until 2009 and the DOT Admin building - terminal was replaced with a new, modern terminal in 1973. In the mid-forties, the Airport School was re-established at Prince George Airport and served resident Department of Transportation children and children from neighbouring farms until the early 1950s. The school had up to three teachers and up to twenty-five students in grades one to six, at various times. Prince George Airport was commercialized in 1963 when Mrs. P. Richardson opened the first coffee shop in the terminal. Wildlife such as moose or deer can be seen occasionally from the runway. During the WW2 years, wildlife near the airport was largely wiped out due to airport soldiers hunting in their free time. CP Air operated jet service into the airport during the 1970s primarily with the Boeing 737-200 jet liner with non-stop flights to Vancouver, Fort St. John and Whitehorse as well as direct, no change of plane service to Edmonton, Grande Prairie, Fort Nelson and Watson Lake. CP Air also operated non-stop Boeing 727-100 jet service to Vancouver as well as direct to Edmonton via a stop in Grande Prairie during the mid 1970s. Pacific Western Airlines also served Prince George at this time with Boeing 737-200 jet service to Vancouver, Edmonton, Kamloops and Dawson Creek, and de Havilland Canada DHC-6 Twin Otter turboprop and Douglas DC-3 flights to Kelowna, Penticton, Prince Rupert, Smithers, Terrace, Quesnel and Williams Lake. CP Air and Pacific Western would continue to compete with non-stop service to Vancouver into the 1980s with both airlines flying Boeing 737-200 on the route. Pacific Western acquired CP Air and the combined airlines then operated as Canadian Airlines International. Prince George Airport underwent a significant expansion and revitalization from 2003 to 2005 that included the development of more check-in counters, larger pre-board screening and holding areas, new baggage carousels, and a border control facility for processing international flights. On July 13, 2012, the third-largest operating cargo aircraft landed at Prince George Airport to pick up cargo. The Antonov-124 touched down safely to pick up 7 helicopters from VIH Helicopters en route to Luanda, Angola. The aircraft also fuelled up at Prince George while onsite. The Antonov returned to Prince George three months later with the helicopters. In 2015, the Prince George Airport Authority constructed and opened up a 25,000 sq ft (2,300 m2) cargo warehouse. Rosenau Trucking Ltd. is currently the anchor tenant operating out of the facility. The head office for Northern Thunderbird Air is based in Prince George. NT Air provides charter flights, and flights to Williston Lake and for the flight school and charter flight company Guardian Aerospace. ^ Staff writer (c. 1942). Pilots Handbook of Aerodromes and Seaplane Bases Vol. 2. Royal Canadian Air Force. p. 150(b). ^ Staff writer (c. 1942). Pilots Handbook of Aerodromes and Seaplane Bases Vol. 2. Royal Canadian Air Force. p. 150. US Army in World War II, Military Relations Between US & Canada, Stanley W. Deviaban, Chapter VIII, Activities in Western Canada, pgs 200-203. Wikimedia Commons has media related to Prince George Airport. Past three hours METARs, SPECI and current TAFs for Prince George Airport from Nav Canada as available.